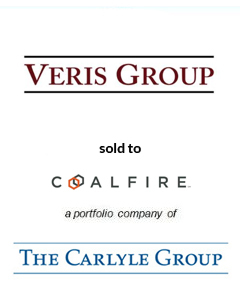 AGC Partners is pleased to announce that its client, Veris Group, a leading cybersecurity service provider, has been acquired by Coalfire Systems, Inc., a portfolio company of The Carlyle Group. This acquisition will augment Coalfire’s existing managed security services platform, accelerating their penetration in the commercial and federal markets. With a team led by Russ Workman, AGC Partners acted as sole financial advisor to Veris Group.